SO! 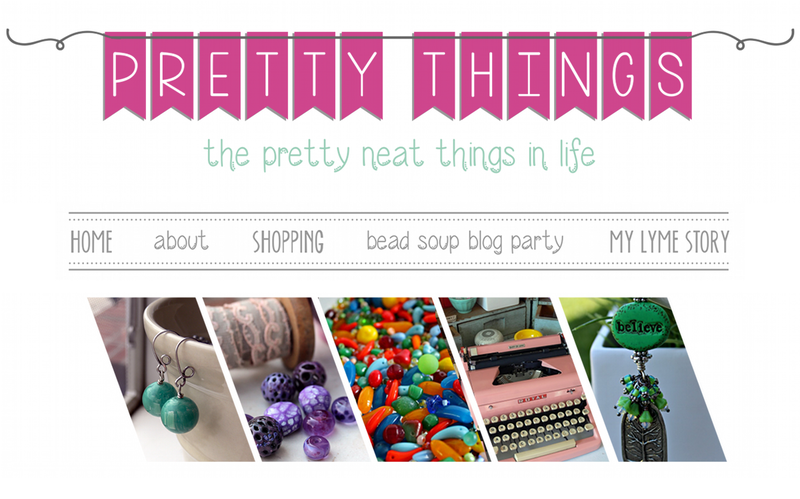 Today I'm introducing you to the six wonderful judges of the 7th Bead Soup Blog Party. This is a new element to the party, where I found an amazing panel of judges to take a look at the BSBP Pin Board. They should all be commended for going through over 900 pins. Nine hundred! How can you show your appreciation? By visiting their stores and web sites and letting them know when you purchase that you met them via Bead Soup. Lisa Niven Kelly was one of the first wire artists I discovered when I began making jewelry about ten years ago. I am still in awe of her work and when she started Beaducation, I was thrilled. I was gifted her Tornado Bead and Toggle kit and was amazed at how easy she made things in her tutorials. Fusion Beads has SO many things to choose from, but I have to say my favorite is the sheer number of Swarovski crystal styles and colors they have. They also have an amazing (and generous!) gallery of Color Ideas and Inspiration Projects. And did you know they offer free US shipping on orders over $25? Fusion Beads will be donating gift certificates. Karin Van Voorhees, the editor of my book, Bead Soup. Karin is a senior editor for Kalmbach Books and has been making things all her life, but jewelry design became her passion nine years ago when she was Associate Editor during the inaugural year of BeadStyle magazine. Many, many necklaces, bracelets, and earrings later, Karin still remembers the challenges of being new to a hobby, and brings the beginner’s perspective to any class she teaches or book she edits. Her design philosophy is centered on perfecting basic skills to make simple, elegant, and wearable jewelry, and is reflected in the projects in her beginner jewelry-making book: The Absolute Beginner's Guide: Stringing Beaded Jewelry. 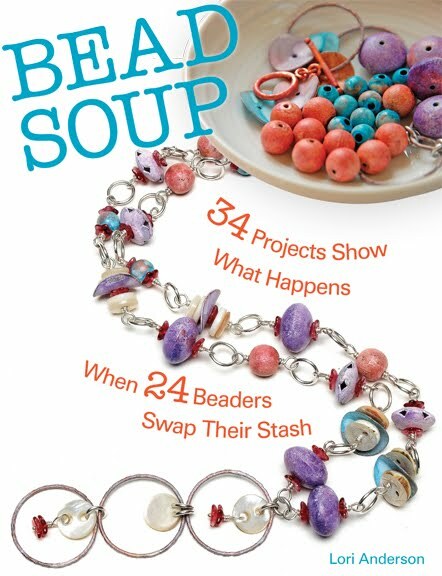 I have to give major kudos to Karin for getting "Bead Soup" off the ground -- it was a huge undertaking, just like the parties! 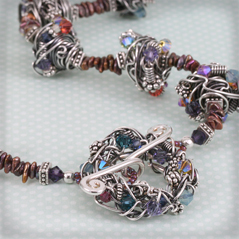 You can meet her at the Bead and Button Show, Kalmbach's flagship bead event, May 29-June 10. Kalmbach is donating a subscription to Bead and Button magazine and the book Create Your Style with the Swarovski Ambassadors. There's a lot to love about Lima Beads. 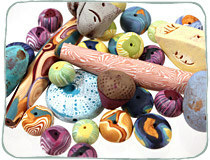 Not only do they carry top-notch art bead designs, but they have some cool web page features, including the Big Green Bead Machine, with nine new bead deals every FIVE MINUTES, but you can also design your own Fresh Picks, picking and choosing from their huge inventory to create a design board. Lima Beads is donating gift certificates. Now we have Nina Designs. When I first made the move to sterling silver in my designs, I discovered the unique beads of Nina Designs. One of the many things I love about this company is their belief in Fair Trade before it was even a term. They have an amazing philanthropic view and pay well over the standard wage to their workers in Indonesia and Thailand. Nina Designs gives back to you, too! When you refer a person to their web site, you receive a $25 credit when your friend makes their first purchase. And they send a lovely handwritten card to let you know, too! 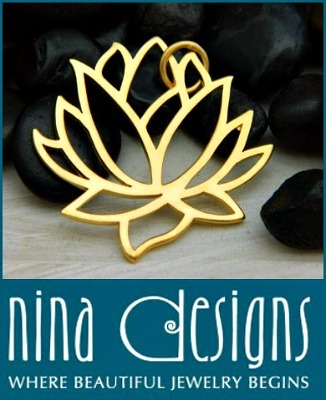 Nina Designs is donating an assortment of their amazing sterling silver charms and beads. we have PJ Tool Jewelry and Craft. 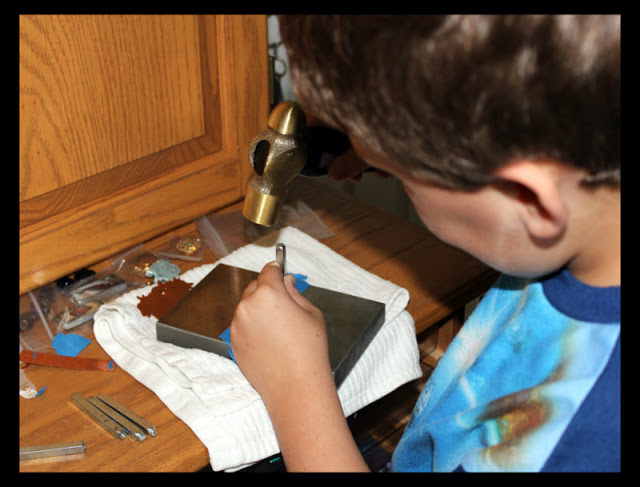 I was first introduced to the metal stamps at PJ Tool a couple of years ago when I had what turned into an epic giveaway of a set of ImpressArt stamps. Holy cow but did you respond! Since then, I've been pleased to test out new products for them, including their awesome stamping hammer. The hammer is so easy to handle that Zack made his own keychain! And PJ Tool offers free US shipping on orders over $20. PJ Tool Jewelry & Craft is giving away a Ballroom Boogie Metal Stamping Kit that includes the Ballroom Boogie lowercase set, an ImpressArt metal stamping hammer, and an ImpressArt steel stamping block ($70 Value). I'd like to thank all of the sponsors for their time and their donations and enthusiasm! 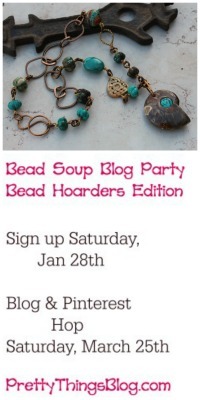 I think this should be a regular part of the Bead Soup Blog Party, don't you? Stay tuned -- this weekend will be the reveal of the winners (an epic, huge post!). WOW! Such eloquent judges! Very impressive! A huge thank you to ALL of our Judges and prize sponsors!! And a nice to meet you to Nina Designs and PJ Tool & Supply whom I have not shopped with before. We'll have to remedy that! Thank you Lori and all of those donating. 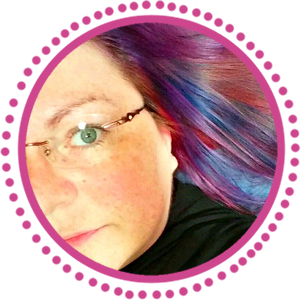 What an exciting blog hop to be part of. I appreciate everyone's efforts. I just read your post introducing the judges. I love this event so much that as I finished reading it, I actually felt shivers run down my back. SHIVERS! About a jewelry event. I love every part of this event. And, now judges - wow, what an exciting addition. I can't wait until the weekend. We have missed your Lori and I hope you are doing better. Feel well! AND, thank you for all that you do. I know that it is epic and doing it when you don't feel well -- well, thank you. Wonderful......So glad to meet the judges!!!!!! Looking forward to seeing your picks! Wow, I'm very pleased to meet these wonderful people who give us so much: their time and interest! 900 pictures is a huge amount of stuff to see and to appreciate and to judge! They are wonder-judges! I've organised a few bead challenges, I've been a judge, I've participated to many as well...so I know how are these challenges from behind the curtains too: it's a huge amount of work, dedication, passion, faith, time, money, pleasure, excitement, relief, wondering, patience ... but it's all worth it!! So I thank you, Lori, for all that you do! 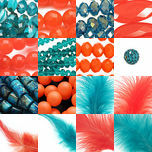 Your passion, faith and positive spirit have made all these things happening, your love for life and beads is contagious! And I thank all the judges for taking the time and putting so much passion in their judging, I am sure it was a very hard job for them, not only for the amount of pictures and pieces, but also because there are so many so beautiful!! 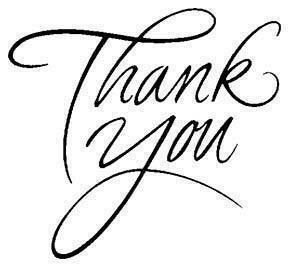 So thank you all for everything, material or not, that you've put in this Bead Soup Party! You are wonder-judges to me! What great judges. I've heard of them all, although I haven't gotten to purchase from them all yet. Will be great to see who they all pick as winners. Although I think everyone that participated is a winner, because we all met new people, got a new stash and stretched our limits. I Think it is great to have such a awesome pick of Judges. Fusion beads I have taught myself from your sight for beading such great tutorial, along with bead and button I just had to have a subscription for a year in 2009 because I was making beaded rings and there was great techniques I learned out of it . Kalmbach wow what a great publisher I can't wait until I can afford the awesome magazines you have edited like the bead soup and the Swavorski elements with all the amazing embassador, wow Lima Bead I just became familiar with you on twitter funny Terry was like who is Lima bean I said (Lima bead lol) and Nina bead it new to me but though bead soup I have been able to use some beads that I hadn't used before. I just want to thank you all for taking part in this amazing BeadSoup that Lori has put together and gathered all of us. Thank you. And Thank you lori. How wonderful to meet all these great companies and people! Thanks go out to you and them for putting this together and spending so much time and supplies on this! It should be part of the soup party :) great idea! Looking forward to the reveal! It was a good idea to let us know who they are affiliated with, as we can patronize their establishments..
What wonderful judges - how exciting! Great group of generous judges, thanks for adding such a cool feature to an already great event. Lori, Thank you for introducing the sponsers. Some of them are new to me, so I appreciate learning about them. Thanks also for your time doing this extra bit.Your bead soup baby has grown up to be quite a time consuming teenager, with a mind of its own, to boot!! What a fantastic and generous group of judges you've gathered, Lori! Awesome group of judges! I love Lima Beads - they are just down the road a piece from my town. an amazing group of judges! thank you for all your hard work! What a fantastic and varied group of judges that you have gathered together. All of them are on my radar for purchases though the only one that I have used so far has been FusionBeads.